Happy Friday; weekend is almost here (and for those of you living across the big pond, you can consider yourself lucky, maybe you're snuggled up on the couch already with a glass of vino or are out with friends). Despite the fact that traffic was pretty heavy that Thursday afternoon and it took us double the amount of time to get there, we are always thrilled to escape the city for a little bit, dogs on board, and get some quiet quality time in. Mountains are our destination of choice, usually, since we live right by the sea. For a change. That Thursday evening we arrived in the most charming mountain town. We got out of the car, it was chilly and smelled like pine trees. Instant relaxation. 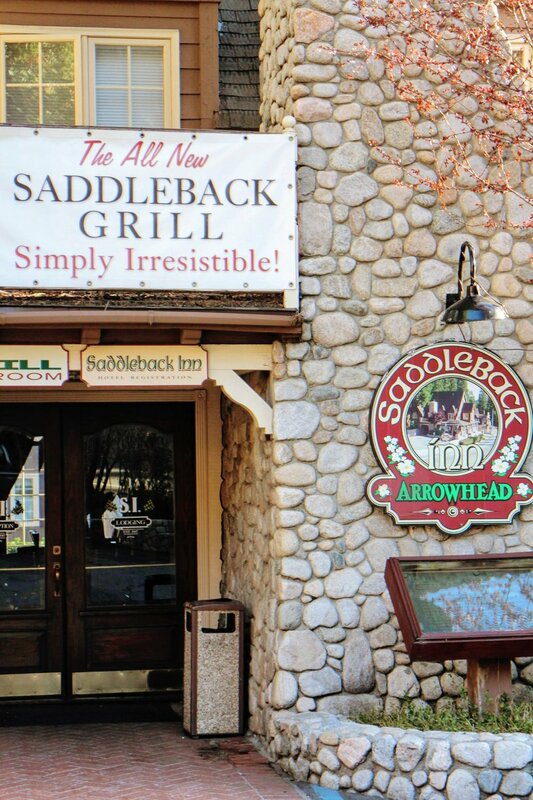 We checked into the Saddleback Inn, where we got a little cabin to ourselves, a bathroom that was pretty much the size of the bedroom, and a cozy fireplace that we put to use (it was electric, but hey, for the ambiance). On the morning of my birthday - I wasn't even fully awake yet - Rickey took the dogs for a quick spin around the lodge and came back with donuts. This man knows me well. We lounged around for a little bit before we got ready for a very simple breakfast in the main lodge. Afterwards, we grabbed the dogs and headed down towards the lake for a little hike around. The weather was great (actually too warm for my liking, I would have loved if it was a little chillier). The morning light was gorgeous. There is something so utterly soothing about being surrounded by trees, listening to the birds chirping, while enjoying complete peace and quiet. The lake was absolutely calm. We started fantasizing about having a little cabin up there. Lake Arrowhead seemed deserted and we were not complaining. Apparently, it gets more busy in the summer months when people come up here for a few weeks straight, taking their boats out on the lake and spending some time up here. I could only imagine how romantic and serene it must be in winter. We soaked it all in. The sun was getting hotter and the temperatures must have risen up to the 80s as we followed the little path around the lake. We grabbed some lunch in town and let the view sink in. Not a bad birthday. Not a bad place. Not at all. As nice as it is to live right by the ocean, I oftentimes dream about owning a little, just very simple cabin, somewhere up in the mountains. A girl can dream. But maybe we'll make this dream reality sometime down the road. Sometime in the late afternoon, we embarked on the drive back, this time not nearly as long as the day before. We stopped a couple times to take in the view as we made our way down the winding mountain road. Lake Arrowhead, we'll be back. Maybe next time, there will be snow?